This freehand nail art is for all the mothers, particularly to my ever supportive and loving mom! So let me start by greeting all moms a very Happy Mother's Day! Flowers. That is all I can think about when I was brainstorming on what nail art design I should wear for this special occasion. Initially, I wanted to paint daisies but decided on something abstract instead. The idea of this design is fairly simple, but I have to admit I was challenged. It took me longer than usual to finish this manicure and I am not complaining! I think I got the effect I wanted -- dainty and colorful. I used 3 thin coats of Dazzle Dry Portia's Wit as background color. Forgive me I forgot to take a photo for a swatch. This normally happens to me when I am engrossed with an idea. Portia's Wit is a creme and opaque off white nail polish. Consistency was on the thick side so I thinned it before application. This is the reason why I used 3 coats for full coverage. It is a good alternative to a white base. For the design, I used acrylic paints, a detailing and stripper nail art brush. I chose to use pastel colors for the abstract flowers. Each flower was painted using 3 colors of the same shade (ombre). You may have observed that it is not a perfect circle. That's one of the things I like about this nail design, irregular shapes is its charm. Next, I painted a thin black swirl over the flowers to make the colors pop. This was quite challenging for me, especially while I was working with my weaker hand. But it is a good practice sometimes to do what is more difficult. Perhaps soon, it wouldn't be as challenging. I used the same color for the stem and tiny leaves. Notice also that I painted the swirls without precision. Sometimes it goes outside or inside the shape. Again, I think it makes this nail design more interesting. For additional flair, I added a few random dots all over. Mother's Day always fall on summer here in our country and this floral nail art fits the season as well. If you want something dainty, fun, and cheerful, you may want to consider trying this nail design. 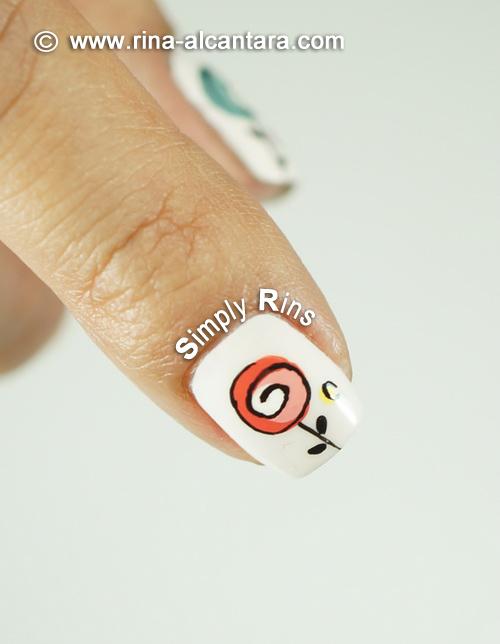 If you are worried about painting the swirls, you may omit that and just draw the stems and leaves. Just make sure you use darker shades of colors for the flowers to make them pop from the almost white background. Would love to know your thoughts on this floral nail art design, a tribute to all moms out there. Did you like it? Oh my gosh, I swear to god, you are killing me with these! I LOVELOVELOVE this mani so much, your little swirly-pop flowers are so whimsical and fun! 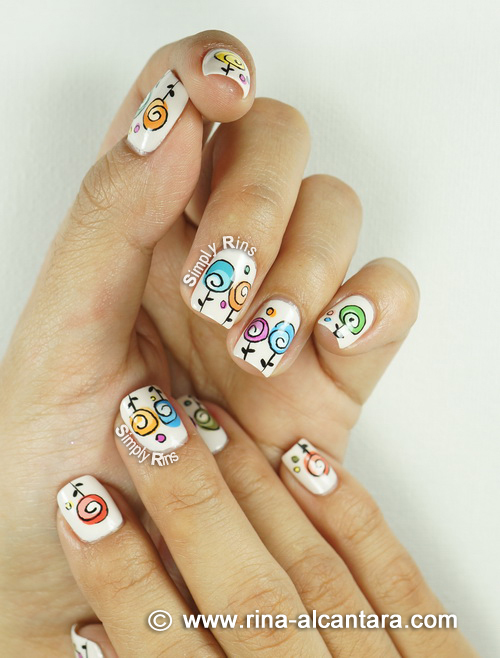 I LOVE this nail art design. In fact, when I redo my nails tonight, this is the design I'm going to use. It's so fun and lighthearted! This is one of the cutest designs I have ever seen! Love it! I love it, very original, as your designs usually are! Whimsical is a good way to describe it. I'm definitely trying this out soon. I so love this design. I would like to follow you via GFC; but I don't see the option? It's really gorgeous and indeed the swirls and stripes don't have to be so perfect. It makes it more original. GFC will be discontinued very soon by Google.